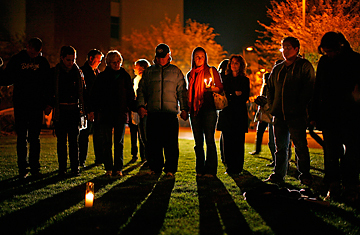 A candlelight vigil outside a hospital in Tucson. New research on grief offers fresh insights into how we cope with loss. Two decades later, a group of researchers at Yale decided to test whether the stages do, in fact, reflect the experience of grief. The researchers used newspaper ads and referrals to recruit 233 recently bereaved people, who were assessed for "grief indicators" in an initial interview and then in a follow-up some months later. In the Kübler-Ross model, acceptance, which she defined as recognizing that your loved one is permanently gone, is the final stage. But the resulting study, published in the Journal of the American Medical Association in 2007, found that most respondents accepted the death of a loved one from the very beginning. On top of that, participants reported feeling more yearning for their loved one than either anger or depression, perhaps the two cornerstone stages in the Kübler-Ross model. Skepticism about the stages has been building in academia for a long time, and yet they still hold sway with practitioners and the general public. A 2008 survey of hospices in Canada found that Kübler-Ross's work was the literature most frequently consulted and distributed to families of dying patients. "Stage theories of grief have become embedded in curricula, textbooks, popular entertainment and media because they offer predictability and a sense of manageability of the powerful emotions associated with bereavement and loss," says Janice Genevro, a psychologist who was commissioned by a Washington nonprofit now called the Center for Advancing Health to do a report on the quality of grief services. In her 2003 report, Genevro concluded that the information being used to help the bereaved was misaligned with the latest research, which increasingly indicates that grief is not a series of steps that ultimately deposit us at a psychological finish line but rather a grab bag of symptoms that come and go and, eventually, simply lift. The American way of grief places great importance on the expression of your darkest emotions. "Anger is a necessary stage of the healing process ... [It] means you are progressing," Kübler-Ross wrote. This may sound good, but it's proving to be inaccurate: expressing negative emotions can actually prolong your distress. In a 2007 study of 66 people who had recently lost a spouse or child, those who did not express their negative emotions six months after their loss were less depressed and anxious and had fewer health complaints at 14 and 25 months than those who did express negative emotions. The study, which included a control group of nonbereaved participants and which was conducted by George Bonanno, a professor at Columbia University's Teachers College who specializes in the psychology of loss and trauma, suggests that tamping down or avoiding those feelings, known as "repressive coping," actually has a protective function. A related myth is the "grief work hypothesis," which defines grief as a project that must be tackled in order to prevent psychological problems. This notion can be traced back to Freud, who wrote that the "work of mourning" was for the ego to detach itself from the deceased so that it could reattach itself to someone else. In the 1970s, Freud's definition of grief as work became the guiding metaphor for modern grief theory. But a 60-person study conducted by the husband-and-wife research team Wolfgang and Margaret Stroebe of Utrecht University found that widows who avoided confronting their loss were not any more depressed than widows who "worked through" their grief. As to the importance of giving grief a voice, several other studies done by the Stroebes indicated that talking or writing about the death of a spouse did not help people adjust to that loss any better. This seems to hold true for other traumatic events, like the terrorist attacks of Sept. 11, 2001. In a study published in the Journal of Consulting and Clinical Psychology in 2008, more than 2,000 people were given the chance to express their reactions in the immediate aftermath of 9/11 and were then followed for the next two years. Contrary to popular belief, people who did not express their initial reactions showed fewer signs of distress later on, while people who did express their reactions had a harder time adjusting. This stereotype can be traced back to a survey of 430 widows in Boston that was conducted from 1967 to 1973  a time when women, especially older ones, were more dependent on their husbands, both for a sense of identity and financial security, than is the case today. Although no men were included in the survey, the author, psychologist Phyllis Silverman, argued that the death of a spouse weighs more heavily on women because it presents a massive identity crisis for them: "While men need others, their self-development focuses more on individuation and autonomy. A woman's identity is largely framed by relationships ... In losing an essential relationship, she loses an essential part of herself." Do women's tears dial down testosterone?